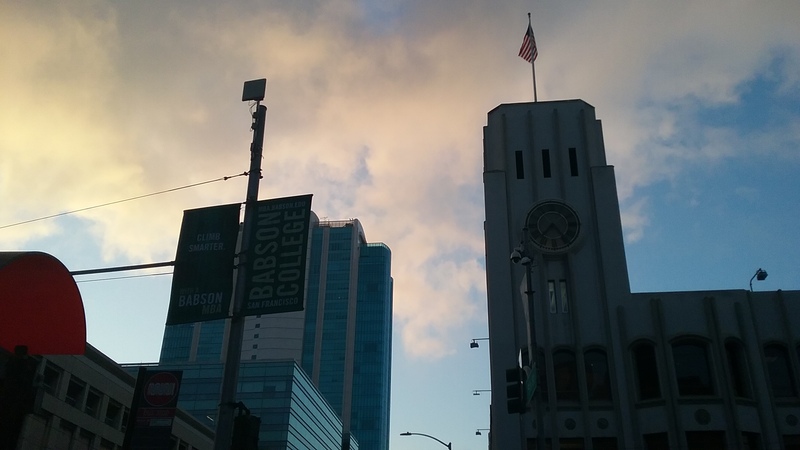 This post concludes my reflections on the experience of GDC 2019, covering the last three days of the trip. If you missed the first part, read it here before continuing. Thursday began bright and early as I readied myself and walked to the Unity Educator Breakfast. While I am neither a teacher nor on track to becoming one, I do have an interest in teaching which my current job as a math instructor has strengthened. The breakfast was an opportunity not only to get a free meal—and a quite good one at that—but to learn and hear anecdotes from people actively using the Unity engine to augment their ordinary classroom instruction. Methods ranged from using the engine in game design or coding practice to using simulations built in the engine to teach chemistry, physics, and more. It was an interesting and engaging event, and I had the opportunity to sit and talk with the coordinator for Columbia’s programming classes around the speakers’ presentations. I decided that, in lieu of attending the session I intended to—on avoiding and recovering from stress and burnout, likely a very useful talk—I would instead peruse the expo hall for the time until I worked the booth. The Day of the Devs booth stood at the north entrance to the expo hall, demoing a variety of independent games. My goal was to gradually ramp up my engagement with others day by day; I spent the first day familiarizing myself with the layout of the hall, I would spend the second interacting with a few booths of interest without overextending myself, then take the third for more involved interactions that would take more of my energy. To an extent, this was successful on the second day. I talked with the representatives of Perforce, a company with a broad suite of development tools including version control and organization, and I spoke with a Warner Bros. recruiter about openings at Netherrealm, a Chicago-based subsidiary responsible for the Mortal Kombat franchise. I also spent around an hour and a half engaged with Microsoft representatives demonstrating features for an in-development suite of cross-platform game development tools. I will readily admit that my purpose for going to the booth was to acquire a copy of the card game they had available, and that, while interesting, most of the finer points went over my head. It was, in its own way, eye-opening to just how much I wasn’t aware of and didn’t understand regarding game development tools. There is always new software to learn which may streamline the development process, but with about five hours of sleep and no intention of immediately using any of the tools described, the end result was an overwhelming energy sink I vastly underestimated. This, unfortunately, did not improve with my time at the Columbia booth. 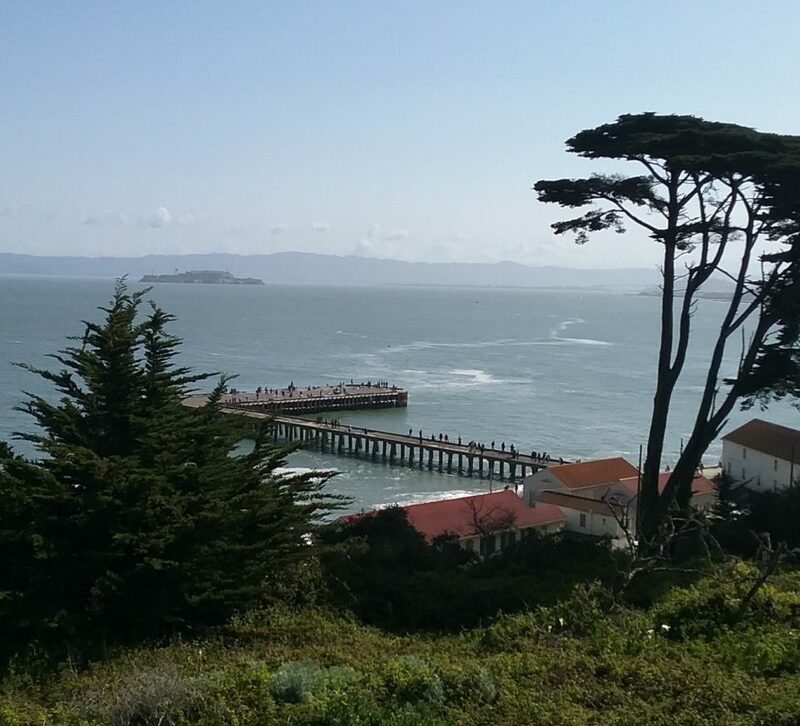 I was up for two hours on Thursday so a friend could participate in an Intel competition—which, I heard later, he did not win but enjoyed regardless—and the two other members of my dev team who attended GDC were present for the entirety. It was a good opportunity to showcase the two projects we brought with us, though as with the day before, only a handful of people stopped to try either game. Of the other handful—people there just to talk, or to market products or jobs—a majority of them focused mostly or entirely on my other team members. One member of my team is significantly more extroverted than I am, and I don’t resent him in the slightest for that. I can’t pretend, though, that being largely passed over didn’t strike a sensitive spot in the insecure part of my brain. By the time I finished my shift, I was pretty overwhelmed and stuck in a negative internal spiral, which prevented me from engaging in the event any further that afternoon. My party had left on a separate excursion while I was working, so I walked back to the hotel on my own to rest and recover for a while. When dealing with this sort of thing, it’s tough to find the balance between solitude and the company of friends. Fortunately, I didn’t have to choose. After a while, my party returned and I went with them to spend time with another friend, and the combination of food and company lifted my spirits substantially by the end of the night. After a couple of late nights, Friday had a late start. I intended to go to a session on involving children in game design, but decided to give myself a more relaxed pace since the content would have been several years in the future from where I currently am. Instead, my party and I, plus the same friend from the night before, had a rather relaxed breakfast and walked to the conference hall in time to try a few indie games before my shift. 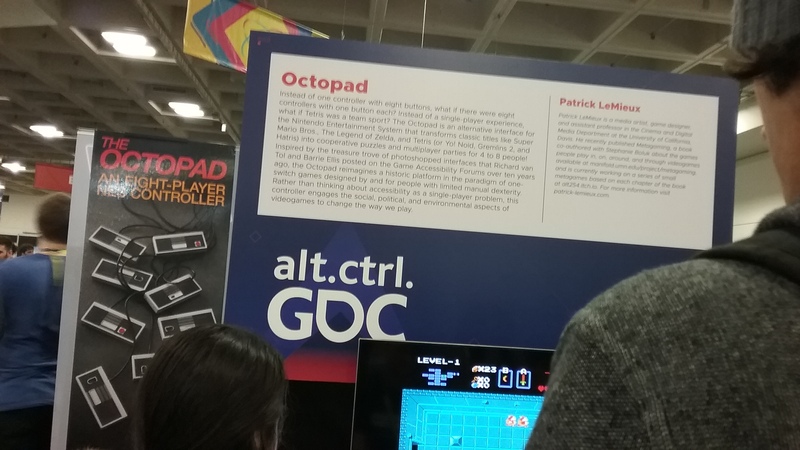 The highlight of this was without question our time at the alt.ctrl.GDC showcase, a collection of experimental experiences designed around nontraditional controllers. This was the most orthodox controller in the alt.ctrl.GDC section, and that’s saying something. These controllers ranged from familiar in appearance—inputs from a single NES controller split across eight, each with one button—to the unusual and bizarre, which made up the vast majority. These included a game played by feeding pages through a paper shredder, a competitive plunger game, a game based around shoveling coal, and an actual couch. My friend and I tried another game, where we were tied back to back in chairs and had to drag ourselves around a small area to press buttons with our feet. I cannot speak for her physical fitness, but I am hardly athletic, and our coordination left something to be desired. Suffice to say, we did not last long with the game’s three strikes system, but it was worth the experience. Just seeing the variety of projects and control mechanisms on display sparked in me a desire to create something similar. There is an incredible opportunity present in creating controller and experience in tandem. All told, the rest of the conference was not very involved. I returned to the Columbia booth for the final time, but it wasn’t long before we started to pack it up—and other booths were doing the same. When all was packed away and everything from small tables to megabooths were coming down around us, we departed the conference hall. 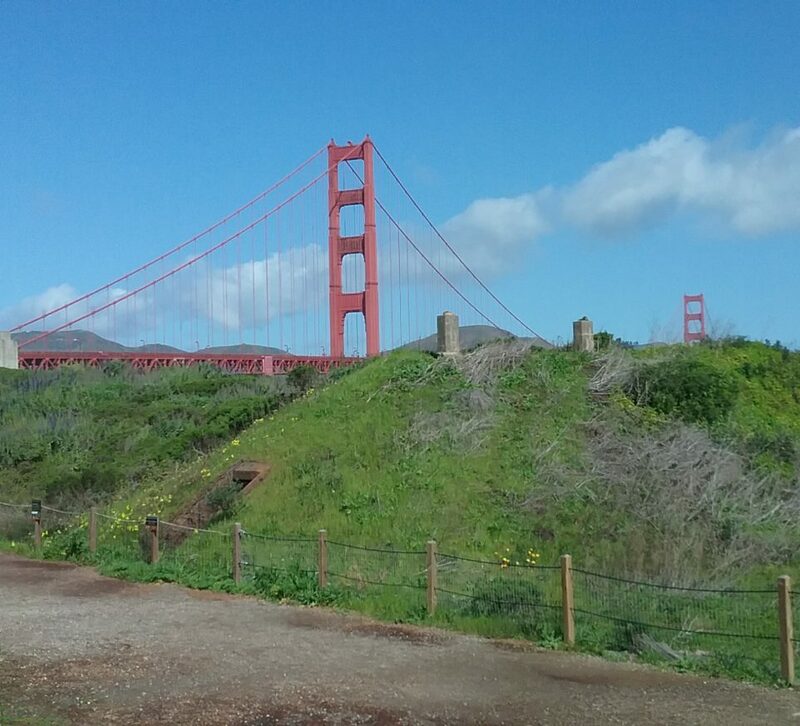 For all intents and purposes, my first GDC had come to an end. This was not to say that the day was over, however. The expo hall closed at 3 in the afternoon, giving us plenty of time to relax and see the city. My party and I returned to our hotel to pack, and we played some Smash Bros. before leaving for dinner. Not only was it our final night in San Francisco, it was the birthday of a mutual friend, so we went out for a nicer dinner to celebrate. In another personal first, we went to an all-you-can-eat Korean barbecue restaurant, and though the wait was long, the quality and sheer volume of food was more than worthwhile. 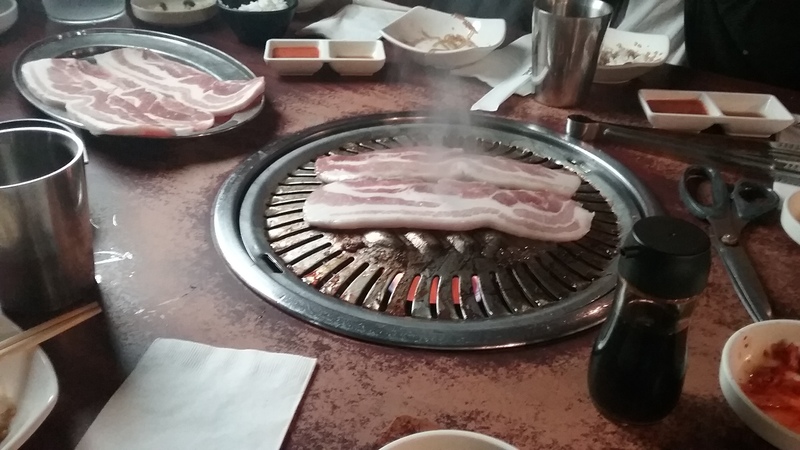 Traditionally, Korean barbecue restaurants set the grill in the table itself, and provide a variety of raw meats for patrons to prepare. Afterward, we decided to get ice cream from a place directly across from the dollar store from Tuesday, where we ran into the two members of my dev team in attendance and a few other people from Columbia. Humorously, after the GitHub party, this was my second most successful instance of networking—and neither occurred at the event itself. When we had long since finished our ice cream and the conversations had died down, we said our goodbyes and returned to the hotel. While the conference was officially over, we still had quite a bit planned for Saturday before catching our flight back to Chicago. Our plane was set to depart around 2 in the afternoon, and there was more sightseeing to be done. Because we had packed the day before, we woke and readied ourselves quickly, checked out of the hotel and checked our bags, then set off in search of breakfast. Funnily enough, we decided on Starbucks, bookending my travels with trips to the coffee shop chain. 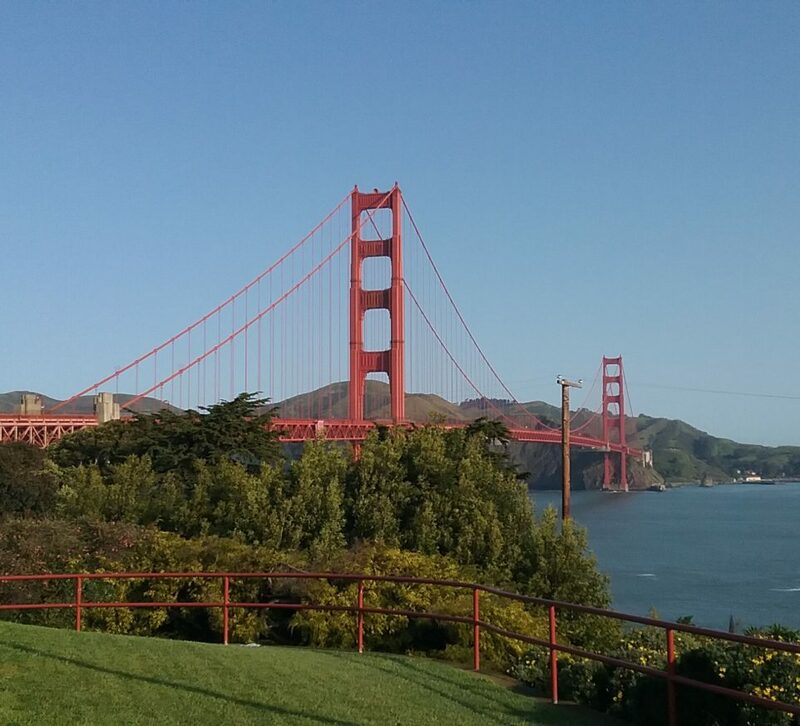 After breakfast, we took an Uber to one of San Francisco’s best-known tourist destinations: the Golden Gate Bridge. There’s little I can say about the bridge which hasn’t already been said, but probably my favorite aspect of it wasn’t even specifically the bridge itself. 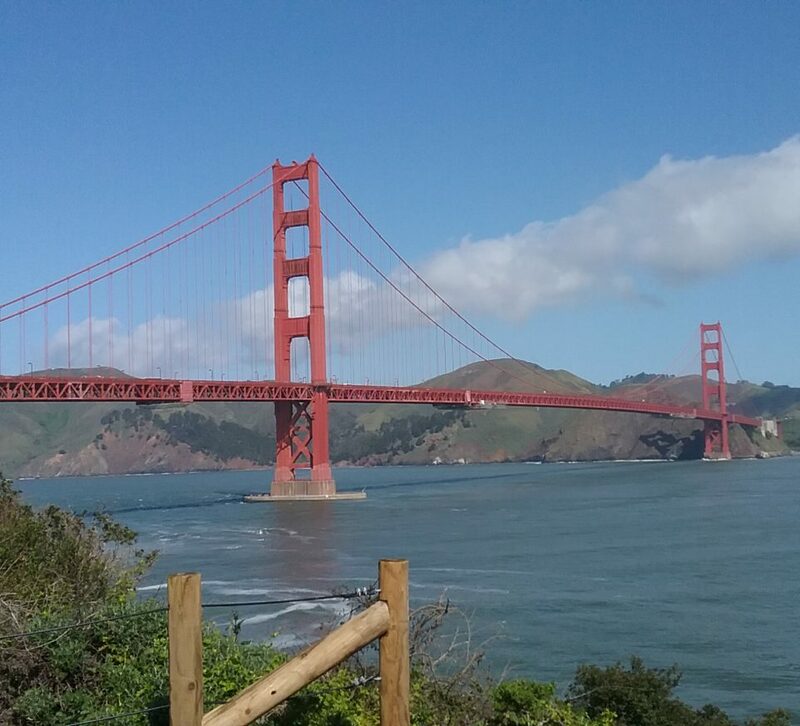 The views of the water, the city skyline in the distance, and the grassy, forested terrain around the bridge were spectacular, and seemed almost at odds with the imposing, metallic structure of the bridge. There’s no shortage of engineering and human development in Chicago, so perhaps I’ve been desensitized to it, but I haven’t been anywhere with so much green in a long while. The first of many pictures of the bridge. 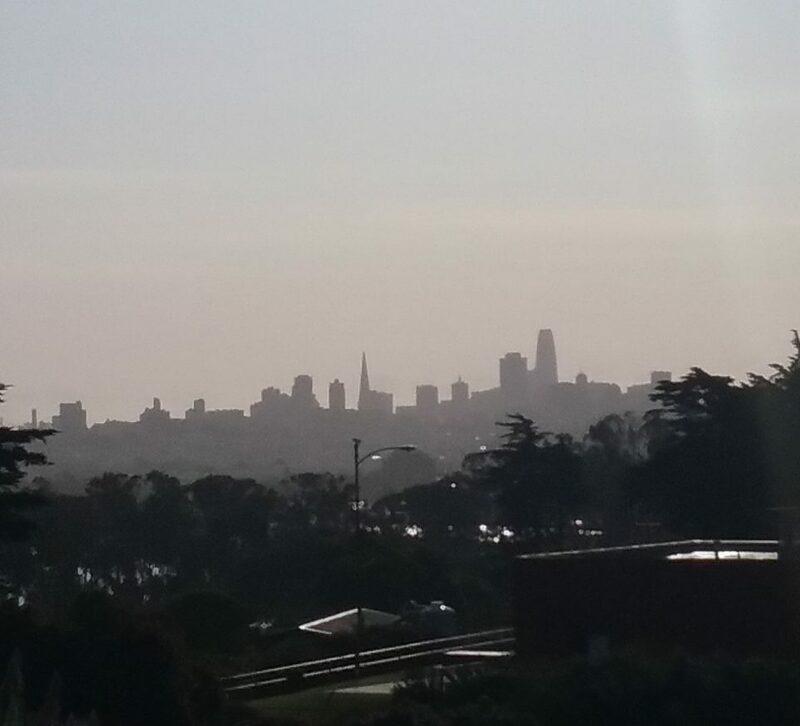 The mid-morning fog made the skyline an imposing sight. 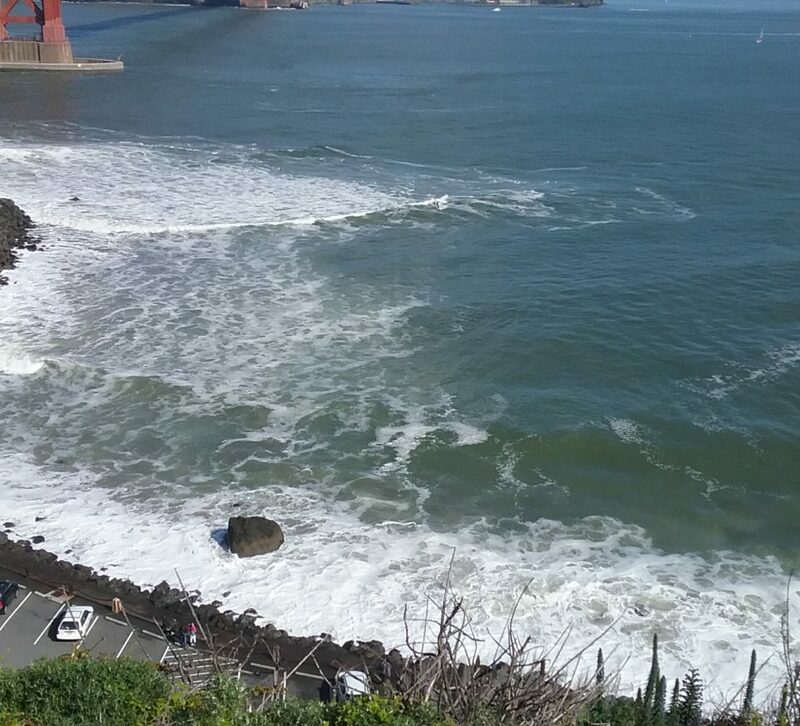 This picture symbolizes the conflict between man and nature, and loudly proclaims "I go to an art school"
The surf around the bridge was almost impossibly white. 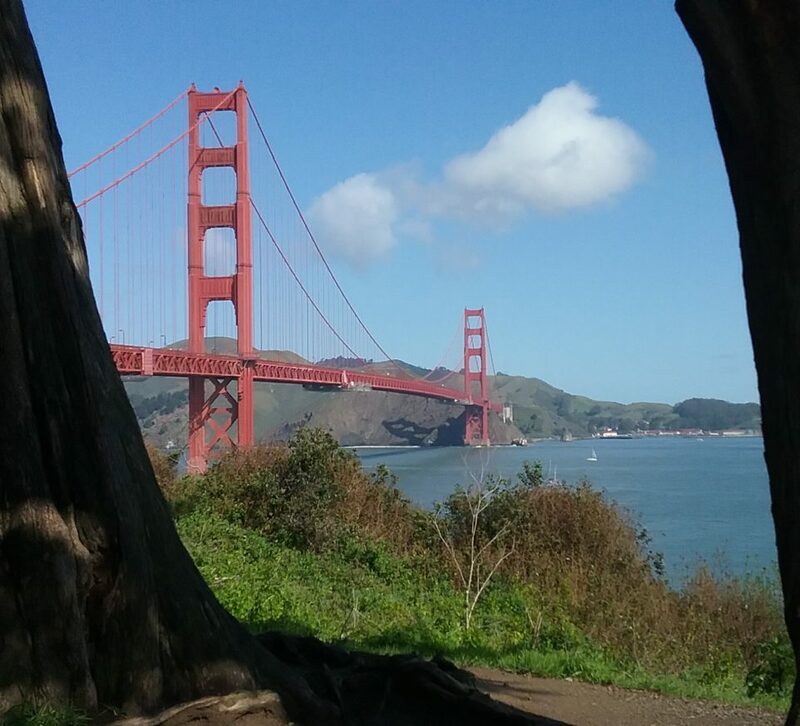 Despite the prominence of the bridge, there was plenty else around to see. These pictures only make up the tip of the iceberg. My camera was quite active that day. After a few hours of wandering up and down and all around the bridge, we returned to the hotel one final time to retrieve our bags before making our way to the airport. Our trek through security and to food was relatively uneventful, and the flight back made it slightly early, despite being a tad turbulent. Time travel didn’t entirely work in our favor this time, as our four hour flight dropped us in a time zone two hours ahead of when we left. It was a late night, but it was good to be back in familiar surroundings with familiar company after an eventful week. 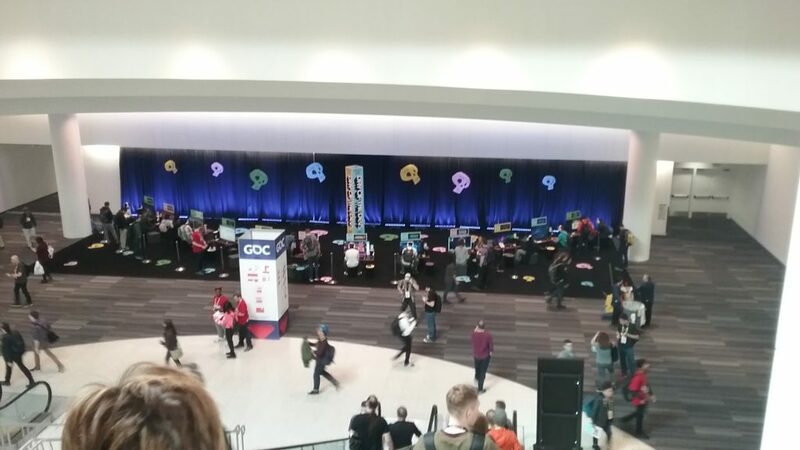 My first experience with GDC was overwhelming, and I’d be lying if I said I did everything I wanted to. Even so, I can’t honestly say that I’d substantially change anything about the trip either. 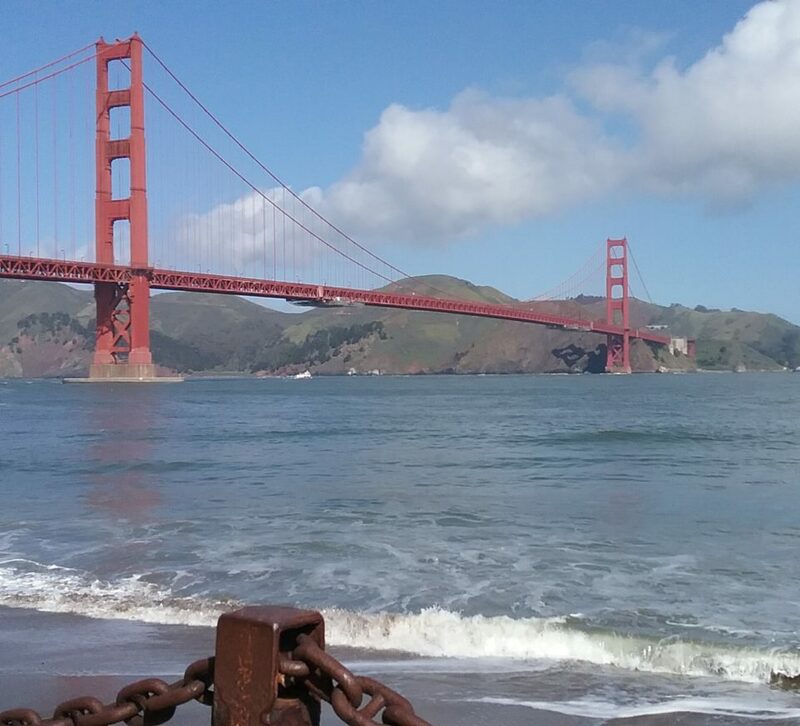 I had a great time seeing a place I’d never been before, and can now share similar conversations with my mother and sister, who visited San Francisco on a choir trip a year ago. I had friends around to support me and be decisive when I couldn’t be, and the trip was all the better for their company. Crucially, I learned that all the preparation in the world for a professional appearance—new business cards, resumes, and other articles—don’t do much of anything if I have not prepared myself to converse with people and inspire interest in what I do. Next time I attend, I need to equip myself not with shiny professional things—nice though they are—but with the confidence to accept and discuss what I’ve done and what I’m passionate about. I don’t have to magically become an extrovert, but I need to more effectively manage my energy, balance experiences with rest, and step out of my comfort zone to meet potentially like-minded people. I have a lot to learn from this world and this industry, and I will not back down now that I know what awaits me. If this is any indication, there are very exciting things in your future! Keep up the good work and the confidence will come in time – I believe in you!